Oslo Friends & Fam – if you are not doing anything this Sunday, come by Kulturhuset (Youngs gate 6, 0181, Oslo)! I will be representing Leela Yoga and teaching a 30-minute all-levels *donation-based* Dharma Yoga class from 1PM-1.30PM. 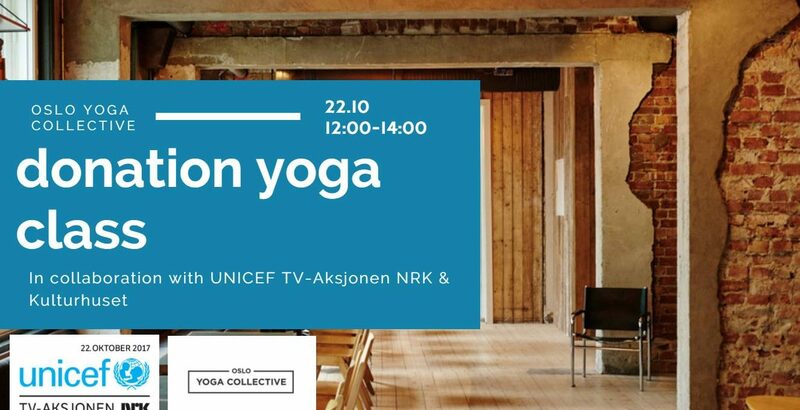 This will be part of the overall 2-hours of back to back *donation-based cIasses* organised by Oslo Yoga Collective to support UNICEF Norge and their latest fundraising campaign to provide education and relief to children in war-stricken areas, specifically South-Sudan, Syria, Mali, Pakistan and Colombia. The NRK Telethon is the largest information campaign and fundraising event in Norway. With the funds from this year’s Telethon, UNICEF will provide education and learning to children caught behind the front lines of war and conflict. We would like to invite you to take part in the annual Norwegian tradition; the NRK Telethon. Every autumn this nationwide charity campaign raises money for a chosen cause. 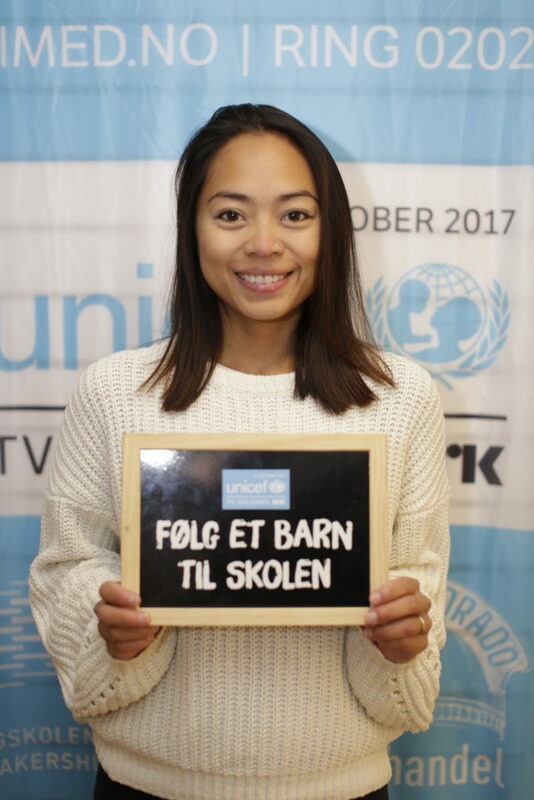 On the 22ndof October we need 100 000 people all over Norway to go door-to-door in their neighborhoods, asking for donations for this year’s charity, UNICEF. We hope you would like to sign up and join us on the most important Sunday stroll of the year. With the funds from the Telethon this year, UNICEF will provide education and learning to children caught behind the front lines of war and conflict. Education gives children a chance to build and secure a future for themselves, their family and their country. This year’s Telethon will provide relief to some of the most vulnerable people in the world, children in South-Sudan, Syria, Mali, Pakistan and Colombia. Time is of the essence, and even the smallest contribution will contribute to children’s future. UNICEF has advocated for the protection of children’s rights for more than 70 years, across 190 countries and territories. Together with partners, UNICEF translates that commitment into practical action, focusing special effort on reaching the most vulnerable and excluded children, to the benefit of all children, everywhere. The NRK Telethon is granted to a different Norwegian organization every year. An independent board of representatives selects the winner based on submitted applications from organizations. The NRK Telethon typically raises between 180 and 240 million NOK, and the organizations are given a timeframe of five years to implement their proposed projects. The NRK Telethon is the largest information campaign and fundraising event in Norway. It involves everyone from local communities to the Royal Family. On the day of the Telethon, NRK (Norwegian Broadcasting Corporation) broadcasts an eight-hour long TV-show reporting from the chosen countries and projects in the field. They also broadcast live from the many fundraising activities happening across the country. A live auction takes place in the TV studio and various musicians and artists dedicated to the cause perform on stage. While money from the door-to door fundraisers is counted, viewers can in real-time check how their county is doing compared to others. This friendly competition is one of many elements making the NRK Telethon a unique national tradition. Celebrities and spokespersons are also invited to feature in the world’s longest radio show hosted by P3, Norway’s biggest radio channel for youth and young adults. The program is 100 hours long and raised 5.5 million NOK in 2016. The Telethon, with all its activities, has a massive reach in local, regional and national media. Local papers feature community members engaged in fundraising activities and write stories to mobilize volunteers for the door-to-door campaign. In the weeks leading up to the day itself, the NRK Telethon is one of the most visible news items in Norwegian media. As part of the awareness campaign, students all over the country are invited to use a free online education program, based on the topic of the Telethon. The material is age appropriate and developed for students in primary and secondary school. This year the education program will focus on the importance of education, children’s rights and how UNICEF is able to provide education in areas ravaged by war and conflict. The NRK Telethon has run every year since 1974. This year’s Telethon is the 22nd of October.